The Go Tell the Bees KAL is underway, and we’re having a grand time chatting over in the Ravelry thread. It’s not too late to join the KAL; we’re knitting at our own pace and just having fun. Some of the tips that have come out of the cast on thread are particularly helpful, so I thought I’d share them here. I chose the cable cast on for the beginning of this project, which starts at the lower edge. Why not use a long tail cast on? Because the cast on is huge, 350-400 stitches. I’d hate to run out of yarn just before my goal. Why not use the two ended long tail cast on? Because I’m using a gradient/ombre ball of yarn, which means that the other end is a different color. I thought it might be pretty that way, but I tried it and it wasn’t at all pretty. Also, the first row after a long tail cast on is the purl/bumpy side, which is part of why it wasn’t pretty, for this particular pattern. The first row after a cable cast on is the knit/smooth side, which is what I wanted. The tip for any long cast on is to use markers to help you count. You can place them after every 20, or 50, or whatever number of stitches, and then not have to count all the stitches at once after you’re done. Much better than long counting, and coming up with a different number several times. If you think ahead while you’re casting on, you can place the markers at your stitch repeats. Figure out how many stitches are outside the repeat and add them to the first section, then place the following markers to note your repeats. I once took a class in fixing mistakes, and that teacher said you should count on the WS rows to make sure you have the right number and kind of stitches. Me, I’d rather relax on those WS rows and deal with mistakes on the next RS row. Both ways work, but I use those WS rows for reading or chatting! I’m going to be teaching two of my favorite classes at Oregon Flock and Fiber Festival in September. This year’s festival runs from Friday Sept. 22 (classes only on Friday) through Sunday Sept. 24. The theme at OFFF this year is lace, and you know I love that! 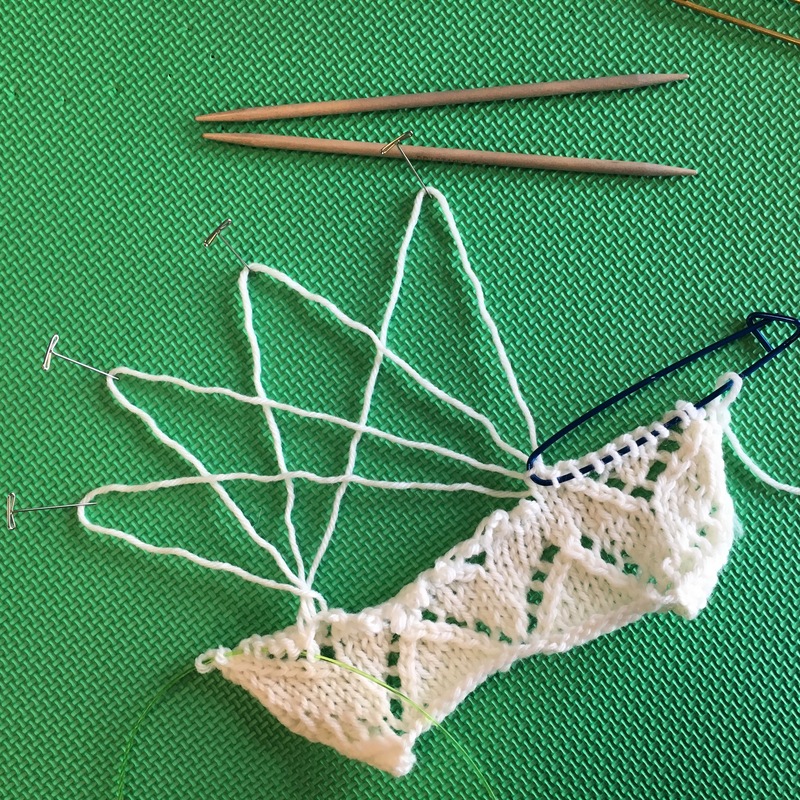 I’m teaching Tink Drop Frog, Fixing Mistakes: Lace Edition on Saturday Sept. 23 from 9:30 to 12:30. 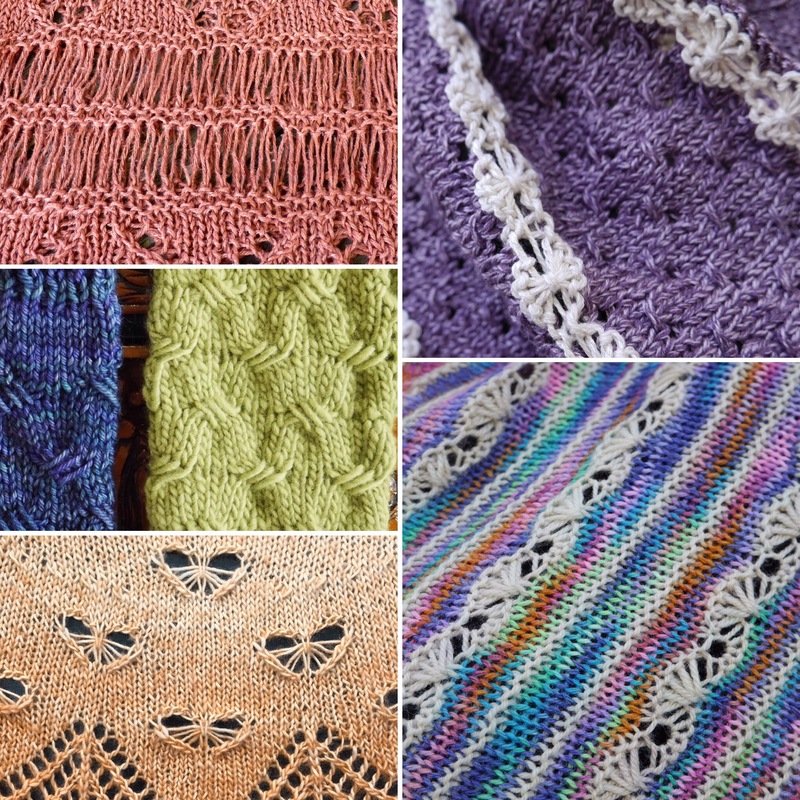 We’ll be learning ways to fix lace mistakes when you’ve noticed them in the same row, a row or two later, or even later than that! This is an empowering class; you are really the boss of your knitting when you can use these techniques. I’m also teaching Be Manipulative, Elongated Novelty Stitches on Sunday Sept. 24 from 1:30 to 4:30. The honeybee stitch from Go Tell the Bees is just one of the stitches we’ll be practicing. If you like the lacy look of these stitches, come learn them with me! This entry was posted in classes, events, KAL, Knit, tutorial and tagged Go Tell the Bees, Go Tell the Bees KAL, OFFF, Oregon Flock and Fiber Festival. Bookmark the permalink. Thank you! Someone who uses the cable cast on for really long cast ons! A lot of people react oddly when I tell them that. I have exactly the same reason you do — I don’t want to run out of yarn after casting on 300+ stitches! 🙂 And yes, markers are a blessing when you’re casting on lots of sts. I tend to place them every 25.